Welcome to another new year . It is finally March , March 2019 to be exact . Here presently we are entering into the second week of March 2019 with no break from the winter weather that has been brutalizing our area for the last 2 months . I guess we are paying for a mild November . Maybe climate change is moving our seasons ahead a month . I don’t know , all I do know, is , I am ready for spring and Wiarton Willie promised it would be soon ……..but I think he fibbed. Our weather this winter has been totally unexpected. Little to no snow , unbelievably cold temps then warmer weather coupled with lots of freezing rain. It is a wonder anything can survive these conditions. The dogs are suffering from cabin fever as am I , and I stroll the gardens hoping for signs of spring. I guess it will get here when it gets here . 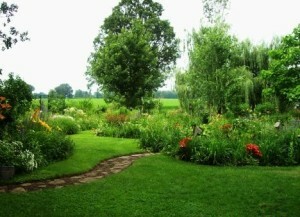 Anyway , welcome , take a look around , enjoy looking at the blooms . Surely spring and all its color is on its way ! Because I can’t count on Wiarton Willie and his prediction, in preparation for the inevitable coming of spring I am planting daylily seeds from some lovely crosses. Weeding has started in the gardens but I can’t stay out there too long right now as my fingers get stiff and unable to bend. Tt is still quite cold even though the frost is out of the ground . The first signs that spring is definitely on its way is the tiny white snowdrops are in bloom and in viewing the gardens , the little nubs of daffodils and narcissus are poking out of the ground . Oh and let me not forget to mention the mud ! This time of year here the mud oozes up through the grass where ever one steps . Waders or Billie boots as we call them are de riguer here right now . it’s cold out there ! The 2017 festive season has come and gone and we have moved into the new year and are back to the winter doldrums . We have had our annual January thaw and truth be told , on Saturday just past it felt more like March than January . It was a much needed break in what seemed to be snow , snow and more snow. Daily snow blowing of paths and driveway had become de rigueur and I was not enjoying it much . It has been bitterly cold on top of all the snow, so a total melt and a bit of warmth was a relief. Of course, now , we will get our second dose of winter and it has started today . Streamers off Lake Huron are coating the ground with the white stuff again ….and so it goes. Since writing the above , we have had a couple more thaws and snows again. 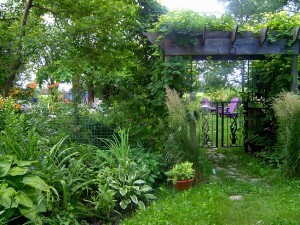 Tomorrow it is calling for more snow …..SIGH!….., I am ready for the gardening season to begin. It can’t get here fast enough to suit me . Hard to believe but another year has come and gone. It was a rough year in the gardens . The year started off with lots of rain and things looked great, but late frosts damaged a lot of the plants and I am not sure they ever fully recovered . Then starting in May 2016 the weather got hotter and the ground started to dry up ……the drought continued well into September. 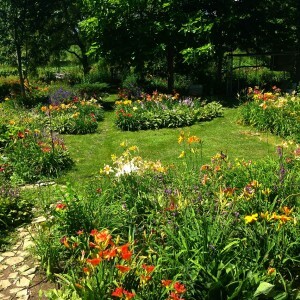 The daylilies were stunted and although many of them bloomed , some daylilies just refused to show their faces . 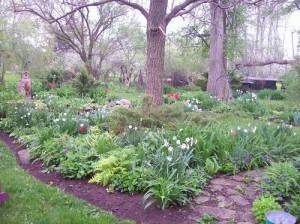 I added quite a number of new daylilies in early spring. Normally they would have bloomed even as newly installed daylilies , however many of them did not bloom due to the extreme drought . Then, in late September we got rain , lots of it . It was very wet and warm and the warm weather extended right into November. This winter so far has been wet and unusually warm until now . We have only about 2 inches of snow but now the bitter winter weather has descended upon us . The daylilies will hopefully survive with what little snow cover we have but truthfully the snow cover is hardly worth mentioning . Wiarton Willy, our local groundhog, said yesterday that we are in for an early spring . 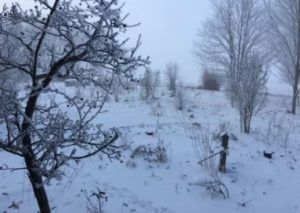 I hope we don’t experience the same scenario as last spring with the killing frosts moving in after the plants have begun to really grow . I have my fingers crossed we won’t go through the same horrendous drought that we did this past season but only time will tell. They say gardeners are forever optimists …and I think that must be true. 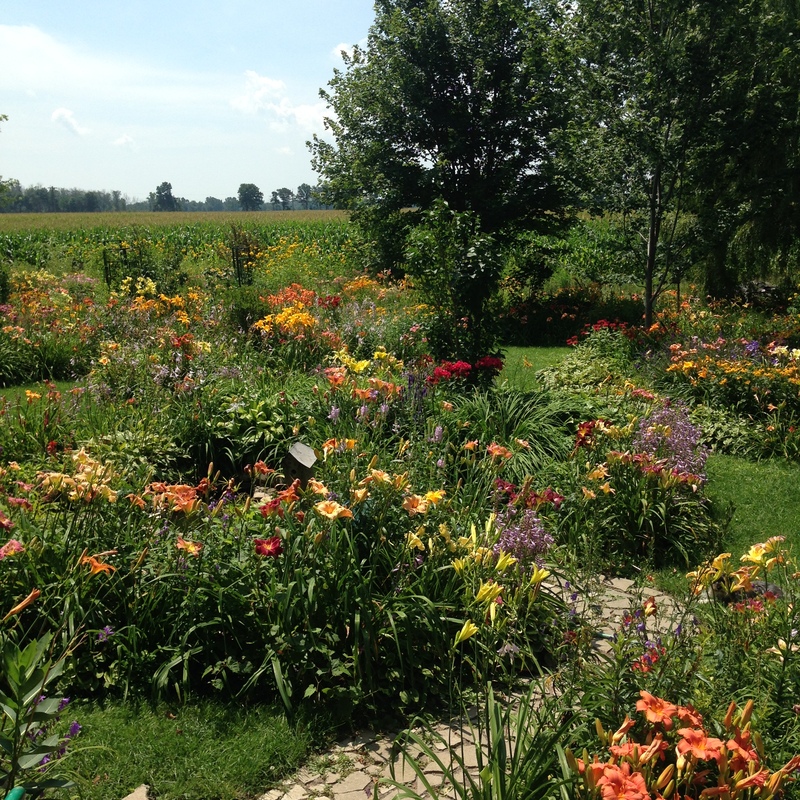 I am planning on adding more daylilies again this spring and I am spending this long, long very grey winter planning and dreaming about just how lovely they will all be when they bloom . (Well ok, almost a year! )This past year has certainly been a year for learning how all this website business works. I have to admit it is an interesting, never dull process but I also have to admit it is time-consuming, sometimes frustrating and ultimately satisfying when I actually accomplish what I set out to do. Preparing pictures to add to the website and actually getting them placed where they need to go has taken me some time and I have many more to do but I am learning as I go along. 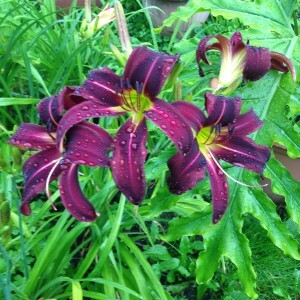 I utimately would like to have the site be an easy to read, informative place with good images of daylilies that I grow. I would appreciate any and all feedback. So for now, I will say thanks for dropping by. The name reflects how this whole thing has come together ……that is ….the gardens, the images and finally the website …….at a snail’s pace.After much work and trial and error I am ready to have the public view the site, so please feel free to take a look around. Perhaps you will find something that interests you, something you simply can’t live without! 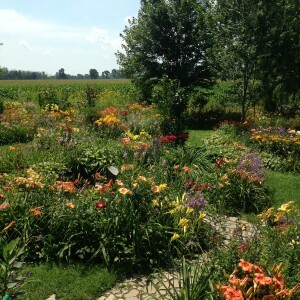 I have been collecting daylilies for about 10 years and talked about putting together a website for many of those years. There was only one thing stopping me, I had no clue how to do it. I received the gift of this website for Christmas 2014……and with the help of my very computer savvy son I am finally able to say ……….. WELCOME AND COME ON IN!